Panama Ragamvila villagers entered in ti their lands after 6 years since the previous government grabbed their lands after burning down their shelters and crops. they fought with the previous government and finally worked for change in the system together with thousands of other depressed people and hence new government came in to power with many promises. Increased salary of government servants by 10,000 LKR, Decreased living costs, One million job opportunities, giving back the lands captured by government/military etc were among the promises. 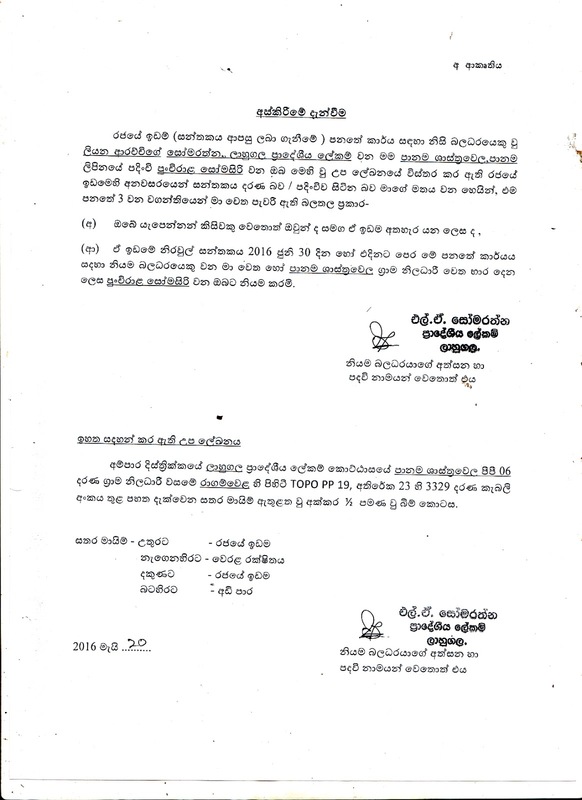 After electing as new government, Mithripala Sirisena as president and Ranil Wicramasinghe as Primminister, released a cabinet decision to release the Pnama Lands belongs to people except 25 acres where some constructions had started by the previous government. but the local authorities does not acted according to cabinet decision and kept the lands without giving chance to people to enter the lands they belongs and used for few generations. After several legal actions taken by people, last March court ordered to let people to use these land without any disturb as they belongs the lands. After the court order, about 25 families out of 36 were entered in to land and settled their with temporary huts with the leader ship of land struggle in Panama P. Somasiri. P. Somasiri lead and continue the struggle since the previous government grabbed those lands in year 2010. He was a big headache for the previous government. He led several legal actions including complaining to human right commission and conducted, participated awareness raising programs for professionals, university students and people around the country together with civil society organisations. Now, This government wants to chase him away from his land together with several other families who have no proper deeds or any other documents to show titles for lands they live in Ragamvila area, Divisional secretary has officially informed them to vacate the land plots they lives.